**DRYER VENT CLEANING STARTS AT $29.95!!! Most people do not know that clean dryer vents are actually important and beneficial to have. Not only do clean dryer vents improve efficiency of your dryer, lower energy costs, but more importantly they make you safer from fire in your home. Your lint trap traps about 60% of the lint, the other 40% goes up and through your dryer vent and dryer vent system. 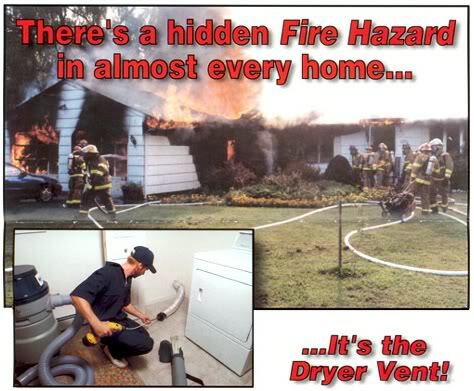 The accumulation of lint in the dryer vent or dryer vent system is a real fire hazard. 98% of your dryer vent cannot be seen. The only part that visible is the dryer exhaust; transition hose and the roof exhaust vent or exterior wall vent on some multi-story dwellings. Most of the dryer vent is in a confined area inside your walls, floor joist, crawl space and attic. A lot of times what you do not see, you forget about. A confined area is a problem because when a fire starts or extends in a confined area or space it may not be noticed as quickly as a fire in an open area. Many sprinkler systems and smoke alarms will not be triggered as fast as they should. wall, through attic area and exits through roof at dryer vent roof exhaust. you have a flapper and a small section or wire mesh. The professional cleaning process cleans all the parts and areas of your dryer vent system from the lint trap to the roof exhaust vent. This is done by brushes, clot busters, flexirod, drill and forced air through the dryer vent. Hundred Million Dollars in property loss are also attributed to dryer vent fires. think of the time that is wasted in doing laundry. you add about $0.70 to your power bill. HAVE YOUR DRYER VENT PROPERLY CLEANED AT LEAST ONCE A YEAR!